12/05/2017 – Today, at the OECD Headquarters in Paris, Lebanon represented by Mr. Ghady El Khoury, Chargé d’affaires of the Embassy of Lebanon in France, signed the Multilateral Convention on Mutual Administrative Assistance in Tax Matters (“The Convention”), therewith becoming the 111th jurisdiction to join the Convention. Lebanon deposited its instrument of ratification for the Convention at the same time. The Convention's impact grows with each new signatory; it also serves as the premier instrument for implementing the Standard for Automatic Exchange of Financial Account Information in Tax Matters developed by the OECD and G20 countries. The Convention will enable Lebanon to fulfil their commitment to begin the first of such exchanges by 2018. 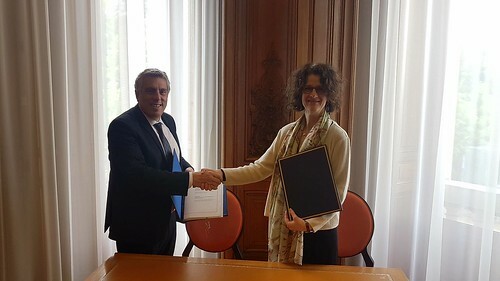 Also, Lebanon has signed today the CRS Multilateral Competent Authority Agreement‎ (CRS MCAA), re-confirming its commitment to implementing the automatic exchange of financial account information pursuant to the OECD/G20 Common Reporting Standard (CRS) in time to commence exchanges in 2018. Lebanon is the 89th jurisdiction to sign the CRS MCAA.